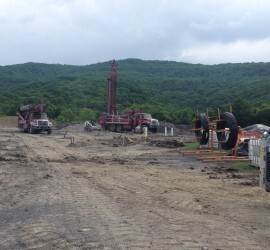 We drilled (112) 405′ geothermal bore holes for this project. Geothermal Solutions did the manifolding and hookups. 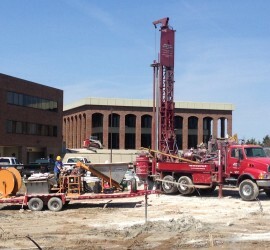 Commercial Bank – West Liberty, Ky.
We drilled (2) 300′ geothermal test wells for Commercial Bank in West Liberty, Ky. The holes were grouted with a thermally enhanced bentonite grout and a thermal conductivity test was performed on one of the wells. 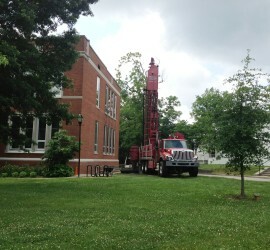 On this project for Berea College-Knapp Hall, we drilled (1) 350′ geothermal test well. 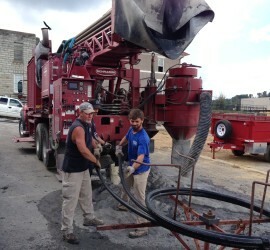 Once the well was drilled and loop installed, we backfilled the well with a thermally enhanced bentonite grout. 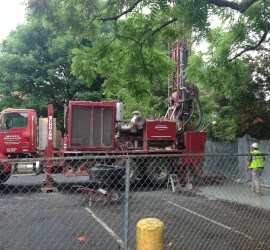 We also performed a thermal conductivity test on this geothermal test well.